Days Bay, arguably the best swimming and fun beach in Wellington. Wharf jumping and swimming to the raft are Days Bay specialties in summer! Self-contained 1 Bedroom Apartment. Own entrance, offstreet parking and outdoor area/garden. SmartTV and Wireless. Warm. Decent water pressure! Equipped for self-catering, included are a few basics (tea coffee, sugar, salt pepper). Ideally 2 people, but absolute maximum 2 adults and 2 kids. Plenty of Babysitters available. Would you like to bring your dog? Please enquire. The East by West Ferry takes commuters to/from Days Bay and Wellington throughout the day and also stops at historic Matiu/Somes Island. 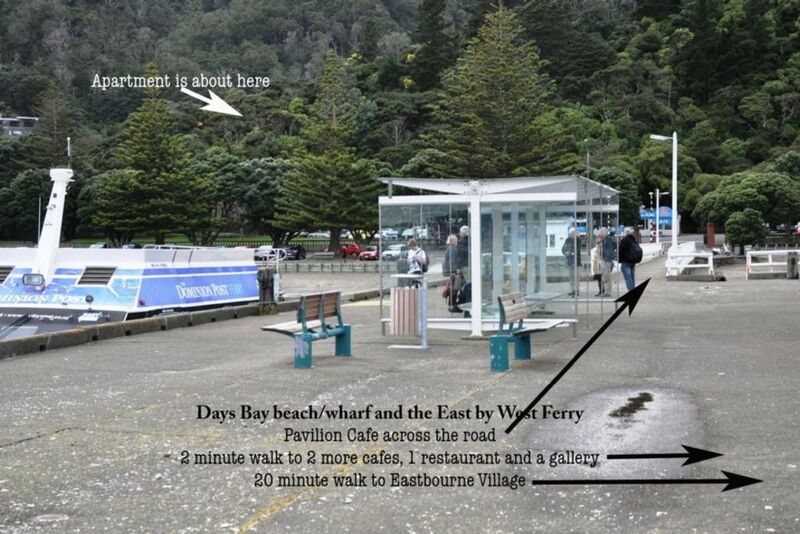 Within a 2 minutes walk of the apartment, you can experience the Days Bay swimming beach, Days Bay Pizzeria, Days Bay Pavilion Cafe, Days Bay Cafe, Cobar Restaurant (amazing views to Wellington), a gift shop, the Eastbourne Ferry (20mins to Wellington), Bus Stop, Williams park, tennis courts and bush walks galore. Within 5 minutes drive or 20 minutes walk along the beach front is the Eastbourne Village: supermarket, pharmacy, deli, post shop, gift shshops, Fish and Chips, Indian Takeaway, Library, cafes, playground, outdoor swimming pool, school and the pub. If you would like to see more information on Days Bay and the Eastbourne area, go YouTube and search "Days Bay and Eastbourne"
Wellington Airport - about 40 minute drive - traffic dependant. InterIslander ferry - about 20 minute drive. East by West harbour ferry - 20 minute ferry ride. This apartment is available on a "leave it as you found it" basis. No parties at all, as we appreciate our neighbours. Dec/Jan/Feb - bookings of less than 4 nights will be confirmed from September onwards. We love our location and the amenities at our doorstep, it is a different pace of life from being in the city. The beach and the bush less that 5 minutes walk. Sunset beach walks, bush picnics, explore the lighthouse. Parking can be either on the street (safe) or off street with gates closed. Basic pantry items supplied at the start of your stay: Sugar, salt, pepper, tea, coffee, flour, oil. The kitchen is fully stocked with utensils, pots and pans, crockery, cutlery and glassware. It also contains a 2 burner hob, microwave, fridge, dishwasher, washing machine and bench top oven. Suitable for walkers or wheelchairs. Entrance options include 2 steps or a gentle path that rises about 0.4m over a 5m path. We really enjoyed our Days Bay holiday. Close to the beach yet still close to the city. Lovely big shower, very comfortable beds, and all the kitchen facilities we needed. Even though the owners were upstairs, our privacy was totally respected. Would definitely come again! In quite street with off street parking, just big enough for 2 adults & 2 kids (shared bedroom) Lovely clean modern apartment with all the amenities we needed. Comfortable, self contained and close to amenities in both Days Bay and Eastbourne. Easy to get in and out of, and has off road parking. For our needs this was a perfect little apartment (we had a wedding to attend at the Days Bay Pavillion). Clean tidy and easy to use. While sitting underneath the owners residence, it was still very private and you didn't feel like you were trespassing on someone else's private space. Others have remarked that you can here noises from upstairs, but in my opinion this was minor and to be expected. We quickly ignored it. The location is fabulous. A great part of Wellington to base yourself in. Lovely location. Great apartment with very comfy bed. Very friendly area. Great location for ferry to Wellington.